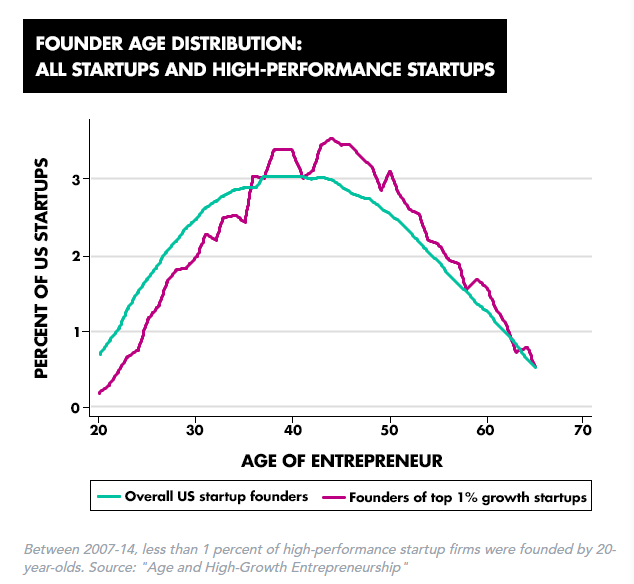 Data suggests there are more successful US business founders in their forties than any other age group. Entrepreneurs come in all shapes and sizes, but new research suggests that middle-aged ones are more successful. Contradicting the popular image of tech-savvy whizz kids launching new empires from college dorms, the data suggests there are more successful US business founders in their forties than any other age group. A study by MIT Sloan School of Management professor Pierre Azoulay and PhD student Daniel Kim analyzed a combination of US Census Bureau data and IRS (Internal Revenue Service) records to examine the link between age and entrepreneurship. Matching census data with IRS records allowed the research team to distinguish between company founders and employees, and between self-employed people and entrepreneurs. They were also able to identify the companies aiming for growth and separate them from others that succeed but are content to remain small, such as local stores or local restaurants. The research looked at 2.7 million business start-ups between 2007 and 2014, and found the average age of people who founded a business and went on to hire at least one employee was 42. The team also found that experience counts. Those entrepreneurs who had worked in the same sector as their business start-up were found to be 125% more successful than those without a background in their chosen sector. Azoulay and Kim’s findings show that a small proportion of high-performing start-ups in the study period were founded by 20-year-olds, less than 1%. Those with the highest growth had an average entrepreneur age of 45. 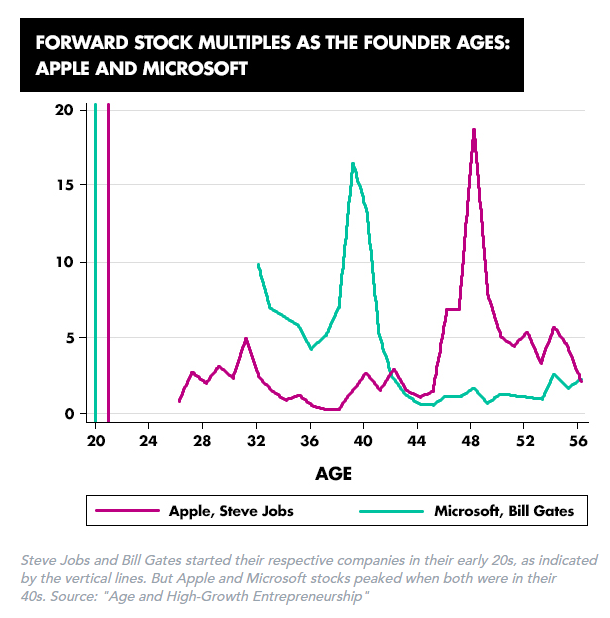 When the data was broken down into categories the average founder ages remained in the early to mid forties. US high-tech companies were started by people with an average age of 43 years old, for venture capital-backed firms the average was 42, and for patented firms the average entrepreneur age was 45. The research team also compared ages across different areas, such as California, New York, Massachusetts and Silicon Valley. The youngest average founder age was 39, in VC-backed companies based in New York. Of course, there are some high-profile examples of very successful young entrepreneurs. Bill Gates and Steve Jobs founded their business behemoths as fresh-faced twenty somethings. But the study points out that these companies peaked many years later, when the founders were in their forties. Good ideas for a business can hit people at any age, but the research suggests life lessons help entrepreneurs turn their ideas into successful companies. Older founders generally have more business experience and industry knowledge, which helps them to overcome problems. Founders in their forties are likely to have developed extensive industry social networks to help recruit staff, make sales connections and find suppliers. They could also benefit from a better understanding of finance and have more access to capital than younger entrepreneurs. The research suggests young people with business ideas might be better off waiting a while before rushing to launch a start-up. And also that some of the numerous grants and programs aimed at encouraging young entrepreneurs could be better aimed at older ones. Why are women less likely to be entrepreneurs than men?